Maine's southernmost coastal towns—Kittery, the Yorks, Ogunquit, and the Kennebunks—are home to miles of sandy beaches sheltered along the rocky coastline of the North Atlantic, historic villages with kitschy arcades, and taffy shops. Located in the Cape Neddick part of The Yorks (the four villages of York Harbor, York Village, York Beach, and Cape Neddick) on the southern Maine seacoast, our secluded little spot provides a quiet retreat but the hustle and bustle of Ogunquit or York are just minutes away. The Bracy House is about 1.8 miles (2.9 km) from Ogunquit center, 7 miles (11.2 km) from York center, 14 miles (22.5 km) from Kittery and Portsmouth, and 40 miles (64.4 km) from Portland. Meaning “beautiful place by the sea” in indigenous Abenaki, Ogunquit was a fishing village and later an artist’s colony in the late 1880s. After 1898—when the Ogunquit Art Colony was established—it was not unusual to see both artists and fishermen working around Fish Cove (later called Perkins Cove). The Ogunquit Museum of American Art and Ogunquit Playhouse celebrate this history as does Perkins Cove, a picturesque inlet spanned by a manually operated draw footbridge. This tidewater basin is filled with colorful sailing dories and surrounded by weathered fishing shacks intermingled with shops, galleries, and restaurants. A coastal walking path called Marginal Way connects Perkins Cove to the center of Ogunquit along craggy cliffs of the Atlantic with bayberry, honeysuckle, and gnarled shrubs of sea roses. 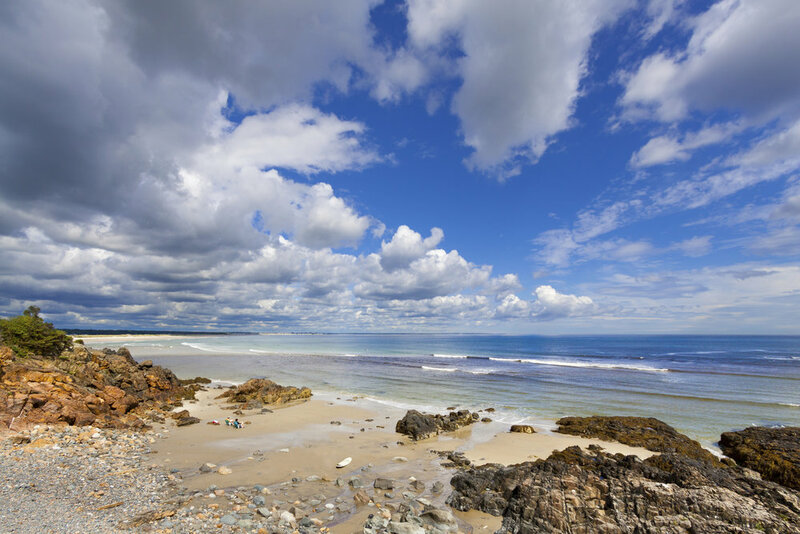 Ogunquit Beach is a 3½-mile stretch of sandy beach and grassy dunes forming a barrier peninsula and has been rated one of the Top 25 Beaches in the United States by TripAdvisor. Ogunquit was named America's Best Coastal Small Town in USA Today's 10 Best Readers' Choice 2016. The Yorks includes the four villages of York Village, York Harbor, York Beach, and Cape Neddick. York Village, the first English city chartered in North America and settled in 1624, feels like a living history museum with a small downtown filled with impeccably maintained historic buildings. York Harbor was developed more than a century ago as a summer resort and many of its grand Victorian mansions and hotels remain. York Beach has a more populist vibe, with RV parks, candy shops, and arcades galore. Cape Neddick, a heavily wooded, mostly residential peninsula extending into the sea, is home to the famous 1879 Nubble Light. This area is home to three golf courses and the four sandy beaches of Long Sands Beach, Short Sands Beach, York Harbor Beach, and Cape Neddick Beach. Other attractions include hiking and mountain biking at Mount Agamenticus (affectionately known as “Big A”), the historic Museums of Old York, Stonewall Kitchen Cooking School, York's Wild Kingdom and the arcades of York Harbor, and renowned restaurants and lobster pounds. Kittery, Maine and Portsmouth, New Hampshire—both located on either side of the mouth of the Piscataqua River—are just South of the house. Settled in 1623, Portsmouth was once one of the nation's busiest ports and shipbuilding cities thanks, in part, to the Portsmouth Naval Shipyard, established in 1800 as the first federal navy yard. Its picturesque streets are filled with Colonial, Georgian, and Federal architecture, a selection of which are now Strawbery Banke—a historic open air museum featuring homes from three centuries. Kittery Point is across the river and includes some of the regions best restaurants—in our opinion—along with quaint shops, a cozy (and tiny) bar, and a bakery whose crullers are known far and wide. Looking to go a bit father a field? Portland is just a stone’s throw away or Boston—where we call home—is easily accessible for a day trip.